It can be difficult to allocate the right CPU, memory, and storage resources to your virtual machines, especially as needs change. Supporting multiple hypervisors often requires multiple VM monitoring tools to achieve the best performance. Once a virtualization issue is identified, it’s difficult to understand what other infrastructure and users may be affected. Virtualization Manager (VMAN) is designed to provide visibility into virtual machines with health and performance issues. 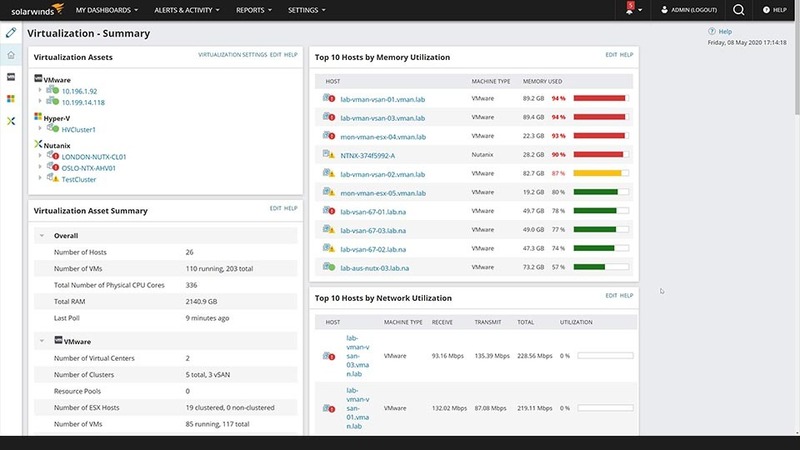 Virtual machine monitoring across VMware vSphere and Microsoft Hyper-V environment. Quickly assess the health of your entire environment across server, virtual, or storage layers. Gain insight into the status and performance, capacity, and usage of your virtualization infrastructure, including hosts, VMs, clusters, containers, vSANs, and other datastores. With this information, you can identify performance bottlenecks and remediate virtual machine issues without logging in to a hypervisor. You can set thresholds and critical warning alerts to match your specific business needs and parameters. VMAN is also designed to deliver predictive recommendations to address active or potential performance issues. Visibility across Hyper-V and VMware performance—whether on-premise, hybrid, or in the cloud—helps you have a more comprehensive understanding of your virtualization environment. VMAN can help you uncover issues unique to VMware vSphere and Microsoft Hyper-V performance using intuitive presentation of alerts with click-through to greater detail for analysis. Corresponding VM monitoring dashboards allow faster troubleshooting, without the need to jump to separate tools for each hypervisor. Quickly assess the health of your entire environment—whether it’s server, virtual, or storage infrastructure—and troubleshoot specific, interrelated problems from one view. The main objective of this platform is to facilitate end-to-end IT monitoring with absolute ease. Drag, drop, and overlay performance metrics from your systems data and multiple sources (network, virtualization, storage, or database), and view data types on a single chart. Comprehensive virtual machine monitor, performance management, capacity planning, and optimization. Designed to provide complete visibility across VMware and Hyper-V—whether on-premise, hybrid, or in the cloud. Address virtualization issues more efficiently, without having to open a separate tool. Reclaim virtual resources with VM sprawl alerts and recommendations. Virtual machine (VM) monitoring software can help provide insight into performance of your VMs and allows you to investigate and remediate any issues.